Will Tobey reviews the motivations, strengths, and weaknesses of nuclear security summits and provides recommendations for how governments can maintain momentum and awareness now that the summit process is over. He concludes that some of the innovations from the process, such as gift baskets and national commitments, progress reports, a contact group outliving the summit meetings, and scenario-based discussions by leaders will continue to be useful tools. Tobey’s recommends that states with nuclear weapons share best security practices, that the United States and Russia reinvigorate nuclear security cooperation, that the next US administration build on the work of its predecessors, and that world leaders fulfill their responsibility for nuclear security. The 2016 nuclear security summit was a pivotal moment for the decades-long effort to secure nuclear material around the globe. As the era of summitry recedes, will states continue improving measures to prevent nuclear theft and sabotage, or will the summits turn out to have been a high-water mark for nuclear security efforts? This article attempts to answer that question. The new report from ACA-PGS features 53 country profiles that demonstrate how the summits’ political momentum and commitment-making model has resulted in meaningful actions by all of the participating countries. The report also proposes that the commitment-making model of diplomacy developed at the summit has itself become a central summit outcome, pointing to its adapted use at the most recent climate conference in Paris. This document condenses 49 National Progress Reports from the 2014 Nuclear Security Summit, providing an overview of actions by states to strengthen nuclear security and prevent nuclear terrorism. 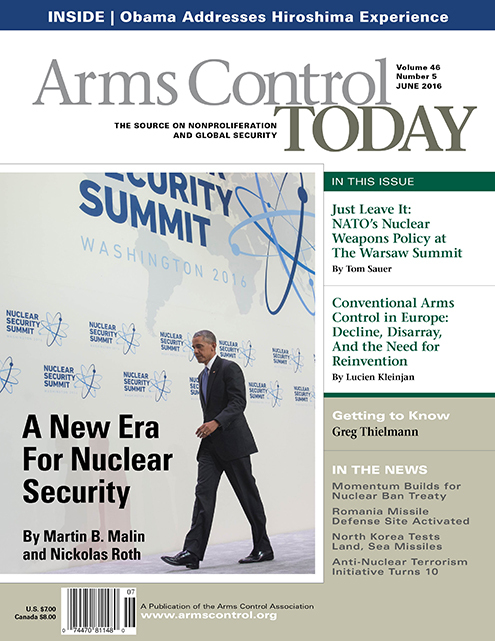 This article offers a brief overview of the Nuclear Security Implementation Initiative and highlights its potentially far-reaching consequences for the future strength of the nuclear security. The author analyzes the weaknesses in the language of the initiative and suggests steps governments can take to ensure it serves as a springboard for further improving the regime. This article offers a background on the three past Nuclear Security Summits (NSS), highlights some of the notable achievements of the NSS process, and discusses the remaining difficult tasks that lie ahead. Appropriate Effective Nuclear Security and Accounting: What Is It?